With the new technology all around us, we are at the pinnacle of change. We are looking, reading and listening to the aspects of the world in a whole new way. Everything is changing. Naturally, with new changes came new technologies which support it. Over and above the existing tools, we are looking at something innovative. At this point, we have all we need and more. The digital evolution has taken a greater shape in publishing industry like no other. Publishing world underwent a huge change with new ideas and innovation. You can now carry millions of books in your pocket and read them whenever you want. E-Books come in all sizes and shapes. Therefore, they are here to stay. You are missing out on many wonderful things if you aren’t getting at EBooks. One of the significant changes we’ve seen is AudioBooks. And that’s where apps like Menestrello come into the picture. When we say that eBooks are here to stay, we are looking at the ideas. The ideas which make books into much more than are. Of course, you can still read them and enjoy them. However, the changes in technology allow you not just to understand but live with them. Thus, features like reading layouts, audio-visual content, 3D graphics, multimedia, etc., make a significant impact. They have become more than just the content they have. Hence, they are making a whole new effort to make a user live the books they read. Presently, you can sync your book habits across devices and platforms as well. You can pick up where you left instantly. And also share out the content to your contacts from within the book. With so many new changes being adapted into books, the future looks bright. As a result of the evolution, we have now complex books or Enhanced books which have changed the way we read a book. Of course, we have now Audiotracks which help you listen to the book than just read them. Naturally, this is a change that is aimed towards people who are more into traveling. An average user can just load up the book and hit play to listen to them. This way he doesn’t have to worry about anything else. Audiobooks are the new gigs up for taking. 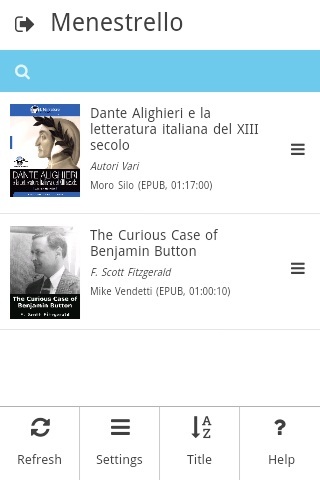 And Menestrello app reader will give you all the options for the best audiobook reading. To get to brief look up at what this reader is all about, we need to have a look at the background. Menestrello comes from the house of Minstrell hybrid reading app. 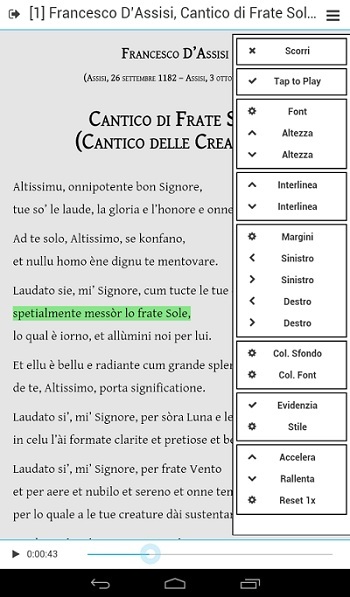 Menestrello originates from a lineage of a great load of features which allow for reading ePub and ePub3 on different platforms. Therefore, you can pick up any eBooks and open it up not only on smartphones, but also other devices like a PC, Mac, etc. With a modular architecture and community growth. All these features meant that the Menestrello reader app was coming out to be a great option. You may have seen that the previous versions ( as per above features list) were looking more towards community growth. They were asking and inviting people to try out the app and leave feedback for it. You could get the app initially for a few days, and when the trial period ended, you’d give some feedback on its performance. Also, you could offer suggestions for improvement. Thus, the development of Menestrello app for Android took a more people approach. You can see that in the smooth way it performs and reads a book. 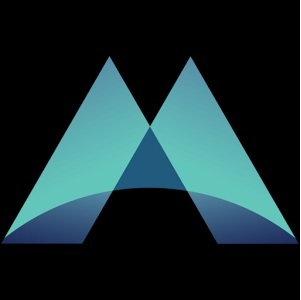 Once the previous versions of the app got acclaim, the company FLOSS came out with a better app. However, this time the app was out to cater the needs of Android users. It was for people using their Android smartphones to read eBooks. Also, you can see that the app will have native support for ePub and ePub2 versions. Initially, these were the versions which were all there. However, with time the app came to support ePub3 versions too. 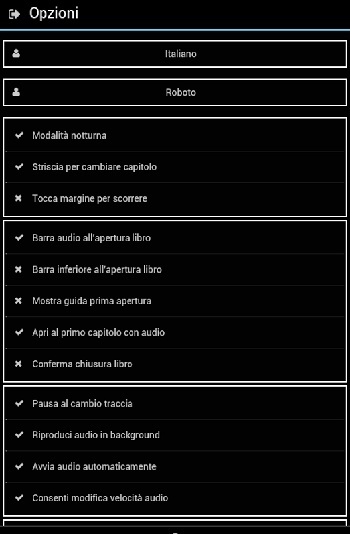 Presently, though, you can use Menestrello to all open and listen to Audiobooks. This makes the app almost a competitor to eBook readings apps like Audible, Aldiko, and Calibre. Each one of them supports Audio files, but usually take up much more space than needed. Menestrello ebook reading app goes beyond this limit as it looks to pack all the features in a small size. As a result, you can download and install this app in even the older versions of smartphones. The app extends support for native PDF’s, Media books (written in ePub or CBR forms) and many other document formats. As we saw earlier, you can get the app and install it on your Android device. All you need to do is, visit the Google Play store and search for Menestrello. Within moments you have the app with you. However, there are some things you may have to consider before taking up the app for reading eBooks. The compatibility issues can rise. To make the reader open any book, ensure that the ePub is verified. What this means is that the ePub file (eBook) shows the characters of such. The primary characters of an epub file are the reflowable text ability. This feature will allow you to open and view books in the same way all over. Reflowable text allows you to ensure that the images and content flow smoothly between the pages, and there is a minimum disturbance. The reading experience needs to be saved. You can, of course, turn and twist your displays and still see the same book. The feature is one of the smartest ones on ePub and Mobi files. However, the ePub versions which load up audio tracks also have a similar advantage in Menestrello Reader. You can use them to narrate to you the entire contents quickly. They are after all Audiobooks. Initially, the reader when it came out supported only ePub files. You could use the app to open and view ePub files, much like any other app such as Blio, Mantano, PubTree or Helicon readers. However, as many others can’t, you can go ahead and open ePub files which are under the version of ePub3. With each format having its significance, eBook readers have come a long way. Presently, we see Amazon going just with the Kindle format. However, Most publishing companies opt for a single format for bringing out their works. CBR is the format which supports Comic book reading. It shows images sequence in a smooth manner and is best useful for reading comics. Also, when it comes to reading multiple formats, Menestrello goes forward. You can perhaps open any format within this app on Android or iOS. With this, we specify that you can open Zip format books like CBZ, ABZ or much more. This helps in loading up your books and carry them in smaller sizes. Apart from this, you can use the reader to open PDF files in Android system. Obviously, the next question that we need to consider is that, what happens when you want to open PDF files with DRM protection. As most eBook readers fail to open DRM files, you can see that this reader is a solid bet there. Thankfully, you can open DRM PDF-files within this app by registering your Adobe login details. In addition to this, you can easily open other text formats as well in this reader. However, you may face difficulties in opening Mobi files in this app. Mobi files are usually opened by specially coded apps or devices. You will often find that Amazon or Mobipocket system apps are opening Mobi. Of course, some other apps opening Mobi files are Calibre, Sigil, Scrivener, etc. Sadly, Menestrello Reader is not one of these eBook readers. If you are looking at opening Mobi files within the reader, you can take up converting the Mobi into PDF. Or Mobi into Epub. You can go ahead and then load up an output file into the Menestrello reader. The reading app for Android gives you multiple language support which helps you get around on international books. You can get support for most eastern languages too with inbuilt Right to Left features as well. However, you may need support on the device as well to utilize the app and the book it reads fully. Usually, Menestrello reader supports these GUI Languages: English, Italian, Danish, French, German, Polish, Spanish, Turkish. This list clearly shows that the app is made for inbuilt support for eastern scripts in sync with other worldwide languages. As a user, you can always use different styles to get the support for multiple formats. However, this app is something which specializes in AudioBook reading. Therefore, you can still open Audiobooks in this app in various languages and still listen to them. Thus, you won’t have any trouble in finding a properly made eBook. You can also install later on files which support the eastern scripts separately from the Homepage of Menestrello Reader. You just have to visit the site and get the help files, in this case, the voice files and install them within your app. However, this may load up your device with much storage. Also, be careful as to what you load up, as you may get the Android application to hang within the device. Having said this, you don’t find this problem in Mac or Apple systems. Perhaps this is because iOS operated on a close ended system and is more careful with the installation criteria. As the case is with many another eBook reader, you get a Library access with the application. With the library facility within the eBook reader, you can never miss out on books to read. You can delete, sync and download as many books as you want. The application also gives you interactive books facility. Naturally, with so many books in you reach you may find it difficult to arrange them. However, you don’t have to worry about the arrangements and sorts. The app comes in with inbuilt support with organizing modes for the books. You can order by author, title, narrator, duration, language or recently open books. This helps you get to the book that you want quickly. One other facility that you get from this app are the sync features to the cloud. You can make or modify your eBooks within the bookshelf even remotely. You just have to install the app on your smart device and visit your bookshelf. After that, you can add and delete your books as you wish and the same will be reflected in any other appliance. This way you can adjust and manage libraries, only catch being you may have to log-in with the same account details. Like most other ePub reader and Audiobook readers, you can adjust the device between different themes between Daylight, Nightlight, and other sepia settings. Though this is not a sell out feature between other readers, you can still find the use for it, when you go ahead and read the book. However, you may have a lesser use for it when you are hearing your books rather than reading them. Audiobook controls like playback speed and volume & speech. When you are listening to the books from your app, you are given options to use volume buttons either on device or headsets to control what you hear. You can increase the speed of the playback, or even pause it through the buttons. Tap gestures are something that can work to your advantage. With this nifty tool, you can use just your fingers to switch from reading mode to hearing way. This is particularly the case with Enhanced books which have all the programming to respond to touch. Touch to get the text and double tap to get the voice feature on. 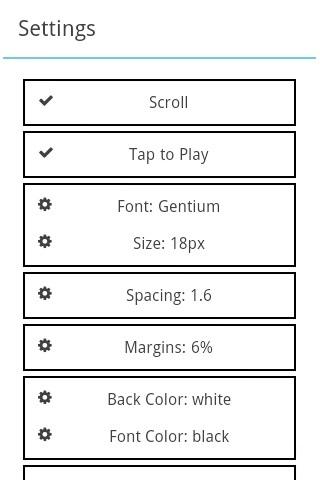 In addition to this, you will have the option to select and read out. You can also select a range, which the app will read, and pause when it comes to the limit range. Thus, you don’t have to worry about swiping between learning modes. The Menestrello Reader takes care of that. You just have to define the range and go on about reading the app. With new options available daily for users, the options for consuming books is getting higher than ever. You no longer have just to sit down and read the book, you can hear them. And it does not just involve merely hearing it; you can control the material as the way you want. You get the control at every possible stage of reading the book. Enhanced Books are the type of formats which you can control every aspect of your reading. However, if you are someone looking at publishing such eBooks, you will need some help. We are a professional publication services company, who will take your eBook to the next level. Visit us today to know more about out wallet-friendly packages and thorough understanding of concepts of ebooks and their interchangeability.